Ive been in love with bicycles all my life. They evoke a most wonderful feeling that words cannot explain, says master bicycle mechanic Beverley Roode, co-owner of Bicycles & Beyond (BAB). She heads up the bicycle assembly facility at Nederburg in Paarl, together with business partner Janine van Beulen Johnson, on behalf of Qhubeka, a charity that moves people forward with bicycles. Qhubeka, a non-profit organisation, provides bicycles to people through its learn-to-earn, work-to-earn and disaster relief programmes throughout South Africa and has distributed more than 75 000 bicycles to date. The plant at Nederburg is the first of its kind in the Western Cape, geared to produce approximately 150 robust, purpose-built bicycles per week. It forms an integral part of the Paarl winerys exclusive premium wine partnership with Team Dimension Data for Qhubeka, the pro-cycling squad known as Africas Team. The squad competes in World Tour races to raise awareness and funds for Qhubeka. The partnership is based on a shared belief that bicycles change lives and views bicycles as an affordable and sustainable solution to some of South Africas most pressing social and economic problems. Nederburgs aim with the partnership is to give back to communities as an investment in the future, in much the same way as it, in its own capacity, is upskilling talented South African wine-growers and winemakers. Roode, who hails from Cape Town, has shown a natural inclination to work with her hands since she was young. The first bicycle I ever owned was a silver Raleigh. I was 14, and remember how incredibly excited I was with stripping it down and building it up again. That bicycle gave me freedom and independence. It took me to school and back and has formed the centre of my world ever since. When I left high school, my options were quite limited. I however knew that I wanted to work with bicycles. But its a mans job, so many people said. That didnt stop me. I started by professional career as a bicycle mechanic working for Soloped Cycles in Cape Town as a shop assistant. Here I gained formal training, which eventually took me all the way to England where I completed my level 3 bicycle mechanic training with Cycle Systems Academy. A few years later, back in Cape Town, I started working for the Bicycle Empowerment Network (BEN), an organisation that promotes sustainable social and economic empowerment through the use of bicycles. Here my enthusiasm for helping others started manifesting, adding an additional layer to my work with bicycles. This is also where I met my business partner, Janine. The rest is history. BAB is non-profit organisation that plays a pivotal role in the communities where it functions, providing a safe and friendly environment where women and youth can learn how to ride a bicycle, be trained in the basics of cycling safety, and in maintaining and fixing bicycles. They also host womens cycling events and bicycle tours, spinning classes as well as special holiday programs in communities to keep vulnerable youth busy during the school holidays. We were approached by Qhubeka in late 2016 to manage their new bicycle assembly facility located at Nederburg, an opportunity we fully embraced. 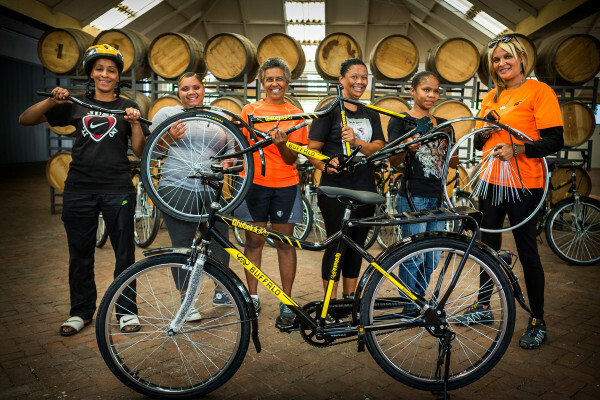 We immediately started with setting up shop and recruiting four previously unemployed women from the local Paarl East community to be trained in bicycle assembly, maintenance and repair, to help us build a minimum of 5 000 bicycles, as per prescribed quality levels, per year. The four women supporting Roode and Johnson in their quest to change lives through bicycles are Jennilee September (31) from Smartie Town, Tammy Letoli (24) from Groenheuwel, as well as Feroska Sitter (35) and Georgina Simpson (33) from Chicago. They each earned a Qhubeka bicycle, and also get paid a monthly salary for the work they do at the facility. Roode is unwavering in her quest to continue imparting knowledge and skills and giving back to communities. In fact, she says that although shes an experienced and qualified bicycle mechanic, she needs to constantly keep abreast of new developments in the cycling world and continue educating herself. To view a video of Roode, go to http://bit.ly/2uUEljT.